The briefcase-styled turntable is a perfect combo of trendy elements and retro style with classical color series, making it an enticing choice for those who enjoy the music with the feeling of roaming through the time. While it is also a unique complement to your decoration. With RCA and headphone jack outputs / line in port (audio cable NOT INCLUDED), you can enjoy the music of vinyl records at your own speaker system and headphone with great sound. And it can also bring along with you the music of iPod, MP3 Player, mobile phones, etc at the turntable player, serving as a music player. With jack outputs and switch mounted on the side, it is easy to operation and play music conveniently. What's more, front-facing built-in speakers and tone arm with soft damping control add to its exquisiteness. Here at 1byone, we stand by our products 100%. This turntable comes with a 12-month guarantee. If any issues arise, we will happily send a replacement on us. Satisfaction is our number one priority, at 1byone. 1. Please follow the instructions carefully before use. When listening to a record, firstly please remove the protective cap and open the tone arm clip to release the tone arm. 2. If the AUTO STOP ON / OFF Switch is turned ON, the record will stop automatically when finished (For some few vinyl records, it will stop when it does not come to the end or it will not stop when it comes to the end). If Auto Stop Control is turned OFF, record will NOT stop automatically when finished. 3. When playing a 45 rpm record, use the included 45rpm adapter and located in the holder near the tone arm. I love this 1byone Belt-Drive 3-Speed Portable Stereo Turntable with Built in Speakers! 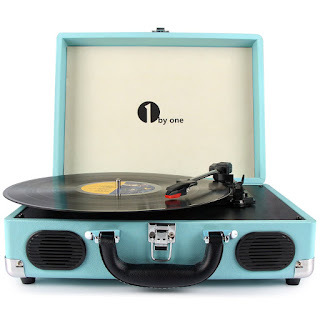 First, I completely love the retro style this music player has and that it comes in turquoise because not only do I love that color but it's extremely popular as a home decor accent color so it's sure to fit with my different home styles. I also love the sound that this 1byone Belt-Drive 3-Speed Portable Stereo Turntable with Built in Speakers can produce. The sounds is wonderful and love the briefcase design because it's perfect for carrying and makes it extremely portable. The control buttons work well and the overall design of this device is quite nice. This is the perfect way to listen to all your old vinyl records that you've been hanging on to all these years!